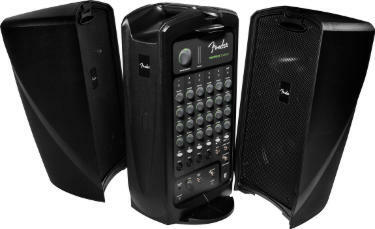 Fender Audio introduces three new portable audio systems to the popular Passport line, the Conference, EVent, and Venue. Fender Passport systems are self-contained portable audio solutions that include everything required for sound anywhere you go. Providing easy operation, the Passport series is suitable for the layperson who needs quality public address with simple functionality. Inside the 'Passport Suitcase' there are two full-range speaker cabinets, a powered mixer, and all the required cables. The refreshed Passport series features upgraded power platforms, better looking and easier to navigate mixer controls, more pro features such as mono out and Bluetooth compatibility, added microphone kits and more. Passport Conference is designed for an array of applications, including education, sporting and worship events; meetings, seminars and presentations; and gigs at parties, small clubs and coffeehouses. The Fender Passport Conference weighs 30 lbs (13.5 kg) and features 175 watts of Class-D power through two 5.25” woofers, and includes a microphone kit, five-channel mixer, XLR and 1/4” mic/line inputs for flexible source connectivity, Volume and tone controls, 1/8” stereo input – to play recorded material from a mobile device or laptop – 1/8” stereo output for headphone monitoring and sending stereo mixes. The Passport Event system with Bluetooth is also ideal for an array of applications, loaning itself towards medium-size audiences. It weighs 43 lbs (19.5 kg) and features 375 watts of Class-D power through two 8” Fender Special Design speakers, and includes a microphone kit, integrated seven-channel Bluetooth-equipped mixer (to stream wireless audio from mobile devices), XLR and 1/4” mic/line inputs for flexible source connectivity, a new developed Hi-Z 1/4” input for guitars, Stereo 1/8” input, Stereo 1/8” output for headphone monitoring and sending stereo mixes, Sub Out with automatic high-pass filter for powered subwoofer use and Mono Out with Level control for powered monitor use. The Passport Venue is not only suitable for the above applications, but as well for DJs and band gigs. The Venue features a convenient USB record/playback system that lets you record performances to a USB flash drive and seamlessly play MP3 and WAV files. Passport VENUE features 600 watts of output power (ample for medium to large audiences), an integrated 10-channel mixer that lets you intuitively mix lecture panels, musical ensembles and more, Reverb to add depth to instruments and vocals, is USB-equipped (to record performances to a USB flash drive and play CD quality 16 bit / 44.1kHz audio files), MP3 and WAV playback, XLR and 1/4” mic/line inputs for flexible source connectivity, Stereo 1/8” input to play recorded material from mobile devices, Stereo 1/8” output for headphone monitoring and sending stereo mixes, Sub Out with automatic high-pass filter for powered subwoofer use and a Mono Out with Level control for powered monitor use.